What are your favorite games? Are they classics like Monopoly or newer games like Apples to Apples? What do you like about them? As Christian Educators we are always looking for new and fun ways to engage people of all ages in learning Bible stories and Christian concepts. To that end, I propose that any game can become a Christian Education Game. Here are my disclaimers: 1) I am not a lawyer and I do not know anything about copyright law. 2) Very few game designs are in the public domain, even the old standards. I make no claim to have any permission to use any ideas, concepts, or art from any source, and I never sell my games or make a profit. 3) All games I mention are intended for private personal use only. That said, let’s make some games! Step one is choose the Bible story or concept you want to teach. If you want to work with a specific Bible story, read and re-read the story in several different versions. Make lists: who are the main and not-so-main characters in the story? Don’t forget the animals. Where does the story take place? Some stories like the Journeys of Paul, or the Exodus take place in several locations, others in one central location. What is the primary action of the main characters? What are the obstacles he or she must overcome? How much of the story do you want to cover? All the Exodus or just the 10 Commandments? Next decide the age of players. Think about the players. Older children enjoy games that require some mastery and skill. Younger children enjoy games with strict rules and some luck. Preschool children need games that do not require reading. They enjoy playing over and over again so games with short rounds are ideal. One important point is that everyone likes to finish the game they start! Do not design a game that takes two hours to play, if you only have 45 minutes in Sunday School to play it; it will just frustrate everyone. Daniel In The Lions Den: based loosely on Parcheesi. 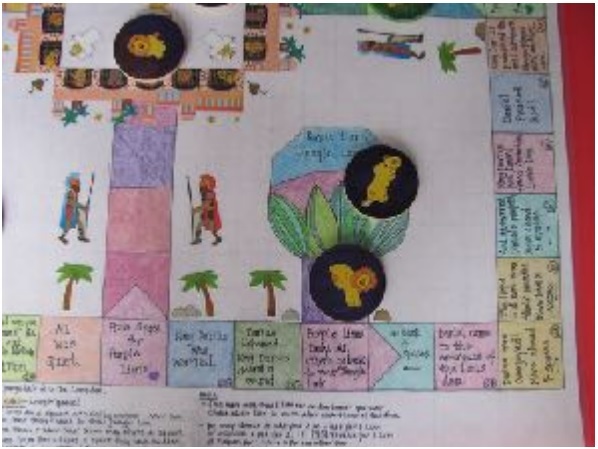 The goal is to move all your lions from home base around the board and into the den while learning the Bible story. to design the game. Think hard about the game. How does the game work? How do I win? How do the pieces move (spinners, dice)? What is the shape of the board? Is that important to the game design? Make a draft/sketch (not fancy or pretty) of the game and use Post-it-notes as the spaces; this way you can move them around easily to get a layout that works well. Once you have settled on a design, test it with actual players. Listen to the feedback; gracefully accept criticism and suggestions. Adjust the design as needed. Be wary of games with too many complicated rules. The simpler the better. Now you are ready to produce the actual game. I can hear you already, “But I can’t draw a straight line with a ruler!” In fact, that is about all you can draw with a ruler—straight lines. The good news is you do not need to be able to draw. First of all, most of my games are made on large graph paper—the kind you use on a flip chart. The lines are already drawn! (If you use a paper game board, a laminator is your friend.) Second you already have a store-house of stickers. (Don’t lie to me—you’re a Christian Educator—I know you do.) Your church has a closet full of old curriculum you can cut up (gasp) for pictures. Your basement, or the upcoming church rummage sale, is full of old game boards and pieces and parts, and the internet is full of free clip art and coloring pages. Use what you have. Be creative. Have fun! Rev. Sharon Grace Budin is an artist, educator, and ordained Presbyterian minister. She is the pastor of Bethany Presbyterian Church in Cleveland, Ohio. She is married to Jewish singer and song writer Noah Budin and together they have raised three children and a myriad of dogs, cats, fish, and small rodent pets.